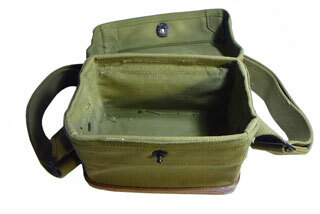 The TG-5 came out in the mid 1930s, more than a decade after the Fuller Phone. It uses an interrupter that is essentially an earphone with a carbon contact type switch driven by the diaphragm. The TG-5 must be operated with the bottom of the case level for the interrupter to work properly. It runs at about 1 kHz. The signal sent over the wire is a DC level, not an audio tone. There's a sensitive relay that detects this DC current and when it closes sounds the tone (if the hi impedance headphone is physically plugged into the jack-switch) or sounds the door bell if the plug is removed. The interrupter is a cleaver way to generate a 1 kHz tone without any tubes or transistors. 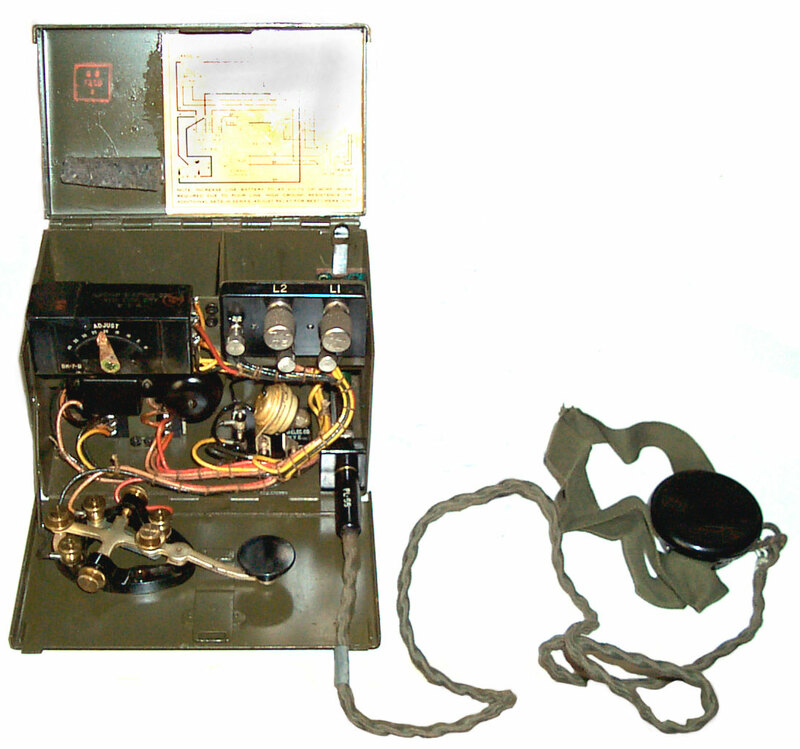 This is not a phone, but a Morse code set that works with a pair of field wire or more commonly with a single wire (or phantom wire) and an Earth ground. 4 x 7 x 5" high. Uses 2 ea. BA-30 "local batteries" and one each (or more if needed) BA-2 22.5 Volt "line Battery". The 22.5 Volt BA-2 has wire leads to connect to the binding post. 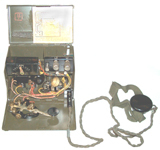 The two BA-30 "D" flashlight cells go in a compartment on the back of the box. Uses a single earphone (HS-32) that stows in the top right of the box. The top left is the larger battery compartment. 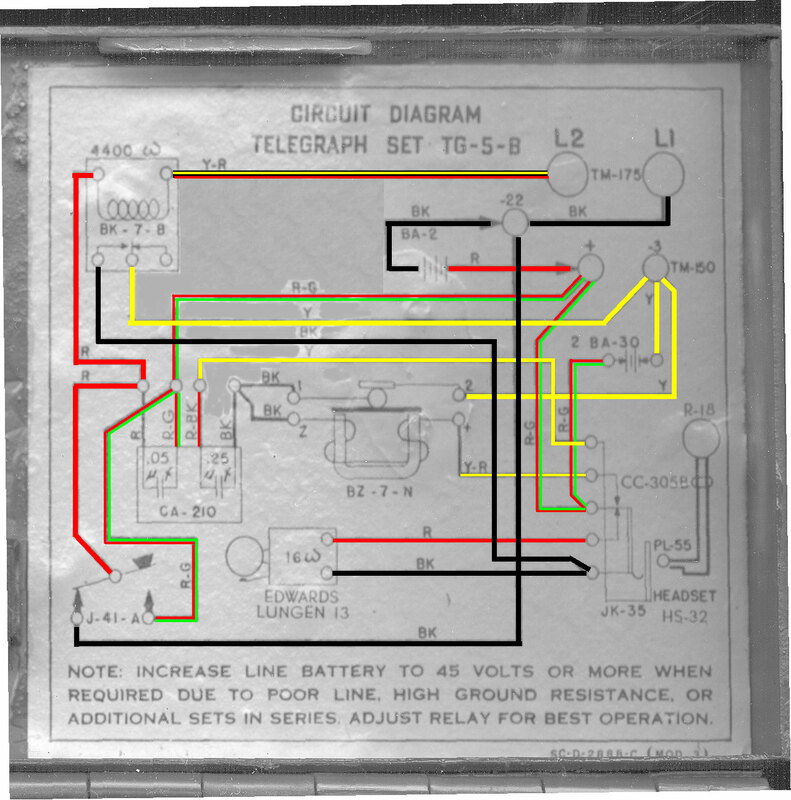 These work with a single wire line and a ground return path, similar to the Fuller phone using a 1,000 Hz tone generated by in interrupter BZ-7-N.
TM 11-351 Telegraph Sets TG-5 and TG-5-A, Sep 22, 1941. Change 2, dated 22 July 1943 adds the "B" revision. The "B" version weight 7 lbs, compared to 6 lbs for the n.c. and "A" versions caused by the box being made of steel instead of Aluminum on the n.c. and "A" versions. There are also newer versions of the interrupter (BZ-7-N) and relay (BK-7-B) in the "B" version The n.c. and "A" versions have adjustments "spring" and "gap" while the "B" version has a single "adjust" for relay optimization. If you have a CS-49-A canvas case please let me know. There are two batteries needed. 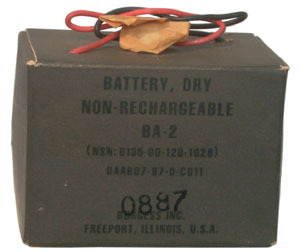 A BA-2 dry battery is used for normal line battery applications, but for long lines additional batteries can be connected in series. Each BA-2 supplies 22.5 Volts. It may be that the TG-5 application is the reason these were still being made. 3 3/8" wide (3 5/8 counting bulge) x 2 1/2" tall (excluding wires) x 1 15/16" deep. 12.6 oz. DMM shows 22.97 Volts open circuit. A couple of BA-30 (common "D" cells) are used for local power. Bag photos from John Forster. I have scanned, cleaned about 95% of the prior copy curd, added some color photos, extensive bookmarks and internal links for paragraph and figure references as well as in the Table of Contents. TM 11-351. The manual was written for the TG-5 and TG-5-A and the two changes add information for the TG-5-B, BUT the changes then were not done are complete pages that could be inserted, but rather as comments, making it very difficult to actually change the manual. This idea was to just keep the change pages with the manual and refer to them. Not a very practical system, and that's probably why it was changed to the current method of changes. So you need to read the changes on this manual. TM 11-351 on CD-ROM to U.S. mailing address $11.50. This is the time this page has been accessed since since 3 July 2004.